Here’s what’s up in the world of TV for Thursday, January 15. All times are Eastern. A To Z (NBC, 9:30 p.m.): While the premiere of A To Z promised to track Andrew and Zelda’s relationship from point A to point Z, things get cut short at “M.” Tonight’s season finale sadly doubles as a series finale for NBC’s rom com sitcom. So where does that leave Andrew and Zelda? Brandon Nowalk has been dying to find out whether the show’s two crazy love birds actually make it, and given that tonight’s episode is titled “M Is For Meant To Be,” chances of a happy ending seem high. 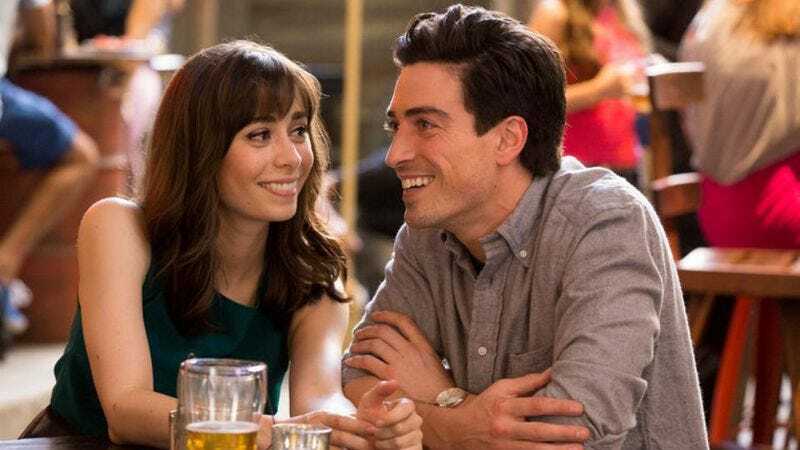 Either way, Cristin Milioti can at least rest assured knowing that whatever happens tonight, it’s bound to be better than the How I Met Your Mother finale. The Vampire Diaries (The CW, 8 p.m.): Carrie Raisler’s always excellent Vampire Diaries reviews tragically died earlier this season, but now they’re rising from the dead like, well, a vampire. Carrie returns to the regular Vampire Diaries beat just in time to watch Caroline and Stefan take a road trip. Reign (The CW, 9 p.m.): Oh how we’ve missed the political scheming, pop music, and pretty dresses of Reign! In tonight’s return from winter hiatus, Mary tries to save Condé, Kenna exposes Catherine’s secrets, and Francis and Bash deal with those pesky Dark Riders. Caroline Framke laces her corset, unsheaths her sword, and checks in on the show’s return. Backstrom (Fox, 9 p.m.): Rainn Wilson throws away the glasses of Dwight Schrute and dons the badge of Detective Lieutenant Everett Backstrom in this new Fox series. In the premiere, the grumpy head of the Portland special-crimes unit investigates an apparent suicide and bangs head with a doctor over his poor dietary choices. In his pre-air review, Joshua Alston called Backstrom “the boorish detective you’ll hate to hate.” Sounds like the show could used more beets, bears, and Battlestar Galactica. There’s a need for content like Half Like Me, as the questions it raises are thought-provoking and personal. Madrigal nails the concept, but doesn’t stick the landing. More humor and depth would take Half Like Me from a decent conversation-starter to a must-see. Regular Show (Cartoon Network, 7:30 p.m.): Mordecai and Rigby take a nap in a crate and wind up in Australia. We hate it when that happens. Bad Judge (NBC, 9 p.m.): Like A To Z, Bad Judge also departs airwaves tonight with a finale appropriately titled “Case Closed.” We sentence Kate Walsh to find a project worthy of her talents. Morgan Spurlock: Inside Man (CNN, 9 p.m.): Morgan Spurlock explores robotics in the third season premiere of his CNN show. Try not to think of Tobias Fünke’s The Man Inside Me as you watch. Kitchen Nightmare (BBC America, 9 p.m.): In this sixth season premiere, Gordon Ramsay travels to Spain to help a restaurant that’s having trouble bringing in customers. Maybe a celebrity chef could increase its profile! If only Ramsay could find one somewhere…. 21 Jump Street (FX, 7:30 p.m.): The A.V. Club’s review notes, “21 Jump Street leans heavily on hyper-self-awareness in ways that can be both refreshing and exhausting.” If that’s not a recommendation, we don’t know what is! Singin’ In The Rain (TCM, 8 p.m.): Not only is Singin’ In The Rain one of the greatest movie musicals ever made, its production history offers a treasure trove of old Hollywood stories. Gene Kelly filmed the iconic singing in the rain sequence with a 103 degree fever and Donald O’Connor wound up in the hospital for exhaustion after filming “Make Em Laugh,” only to learn they had lost the footage and he would have to do it all again. Throughout the shoot, Kelly was reportedly monstrous to the untrained dancer Debbie Reynolds. Thankfully, when Fred Astaire found her crying under a piano he offered to give her dance lessons. X Games Aspen (ESPN, 9 p.m.): Snowboarding and snowmobiling kick off the first day of the 19th X Games. We’re hoping the X Games add snow-gymnastics and snow-pole vault in the near future. Empire: The Lyons visit Philadelphia and try to regain Joshua Alston’s goodwill.